What Happens When You Pair Classic Cars With Their Namesakes? 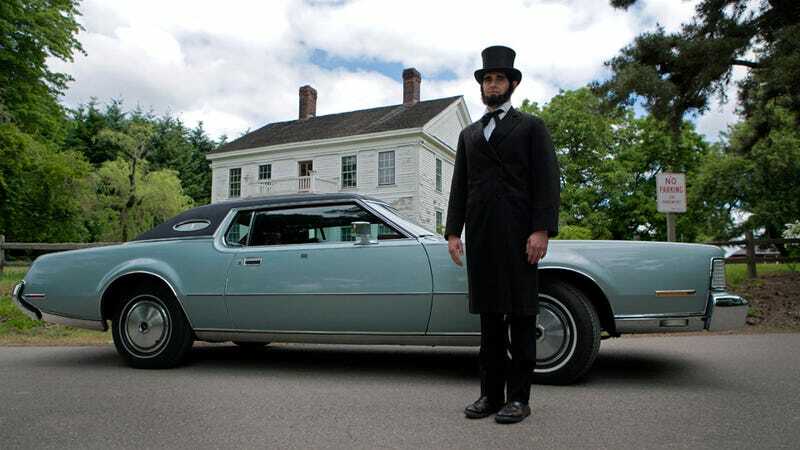 Ever wondered what it would look like if Abe Lincoln stood by a Lincoln, or if Queen Victoria ever met a Ford Crown Vic? Two guys decided to find out. This is Namesake Motors, a series of photographs from Jim Lasser and his friend Ray Gordon in costume. Their pictures are fantastic. Finally, classic cars are paired with the people they're named after. On the website you can see Homer with his Odyssey, Chief Pontiac with his Pontiac, Queen Victoria with her Crown Victoria, Abe Lincoln with his Lincoln Continental, the Lone Ranger with his Ford Ranger, Alice Cooper with his Mini Cooper, and Adam Carolla with his Toyota Carolla. Okay, those last few just share names with each other, but we're not faulting anyone for it. Lasser explained to us how the shoot came to be. I work in advertising, and I worked for the last four years on the creative side of Dodge and Chrysler accounts. I did the Dodge Charger and Challenger campaigns; the Chrysler Eminem and Clint Eastwood campaigns. During that time, as you might imagine, I got interested into cars. I have always been interested in history, and began to wonder about the origins of some of the names of the cars. It raised a lot of questions for me: who was Chief Pontiac? Would Lincoln drive a Lincoln? What would Queen Victoria think of all these cops driving a car named for her? I had the idea of staging these characters in classic (or un-classic) cars of their names. A photographer friend of mine in Portland, Ray Gordon, was someone I immediately thought of to capture this kind of thing. He loves cars and loves weirdo ideas like this. When I pitched him on it he loved it, but told me he didn't want to just "talk about it", he wanted to do it...so we did. He had a few contacts through being a photographer in Portland for people to help with creating the characters. Katherine Ross had been doing hair and makeup for years in Portland, and Kristin Lane was really scrappy at putting together great costumes. I ended up being the talent for each of the shoots, which was an experience in itself. I shaved myself bare to become Chief Pontiac (I haven't had no hair on my chest since I was 17), and stood in public for an hour dressed like the Queen with makeup on (not my happiest moment). As for the cars, I would ask friends, look on craigslist, or Ray would have some contacts through his network of friends. We staged them all around the Portland, Oregon area. Fitting all of this into these four people's busy lives was a feat onto itself. I am still amazed they all put so much time and dedication into my crazy idea. And they all want to do more! So we are planning to do another round of these next spring. Jimm Lasser, Art Director; Ray Gordon, Photographer; Katherine Ross, Hair & Makeup; Kristin Lane, Costume Designer. Jimm Lasser, Art Director; Ray Gordon, Photographer; Kristin Lane, Costume Designer. The shoots are amazing and we encourage you to go check them out in full size at Namesake Motors. Also, give Jim a thank you for scratching this brain itch we've always had about famously-named cars.